Chris Grage in Blenheim sent in these photos of his recently completed Turks and New Zealanders. He has asked Armchair General for advice on the small amount of blood he painted on the New Zealand chap on the left. This figure is wounded, and bleeding would naturally have happened had he been shot or if he had something like an open fracture. But Chris feels it is perhaps a bit wrong to do this, and that it might possibly be seen as a bit disrespectful. He is not sure whether to paint over it, or not. We'll leave this up to Armchair General to make the call. Incidentally the shirts look quite blue in the picture, but Chris actually painted them with Vallejo London Grey, and didn't add or use any blue at all. The same with the Turkish skullcaps - they're also actually grey, but the photo has somehow made them look blue. I asked the Armchair General the following question about painting blood at the begining of the month and here is his reply. 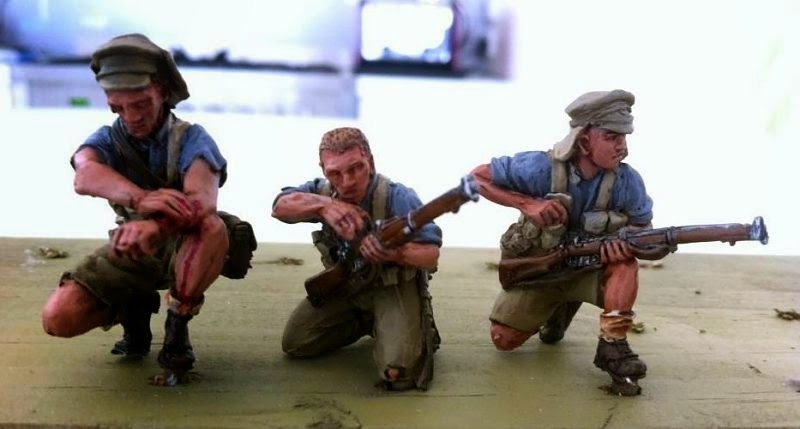 Do you or Peter have any instructions on how much or how little blood you would like to see on the dead or wounded figures, or is it painter's choice? We don't have any guidance, but I would recommend not too much as it will be easier to add some more if needed, rather than lessen the amount if it is too much.